John Cooper Works, JCW Intake for 2007-2010 MINI Cooper S R55, R56, R57 Turbo. 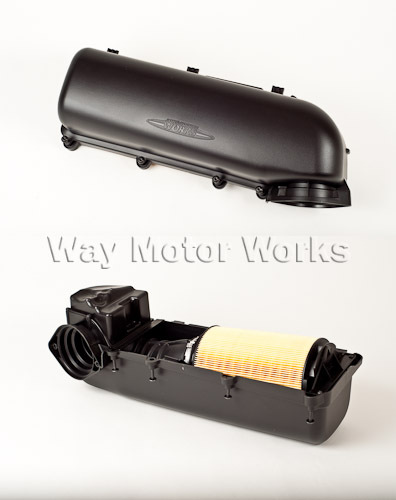 This Intake is the factory engineered intake to be a direct replacement for the stock intake. This will improve airflow and even give you more of that blow off valve sound without being super loud. This uses a high flow cylinder shaped paper air filter. That increases the filter surface area to get more air in the engine to gain more power and torque. This intake will give as much performance gain or even more than other aftermarket intakes. There is a rubber seal for this intake, but it is NOT necessary, and it is expensive. The seal is before the filter so no unfiltered air will enter the engine. But if you are worried about it you can use RTV to make a seal, that would be alot cheaper. NO modification required to install and will keep your factory warranty. If you want to use this intake on a 2011+ Cooper S or John Cooper Works MINI you will need to get the bottom half of a stock intake from a 2007-2010 MCS. Both parts will then bolt directly on.